CNRS (National Scientific Research Center) is the largest research center in France. It employes about 11.000 researchers and its domain of activity ranges from physics to sociology, from chemistry to electronics and so on. Every year researchers are recruited by means of a national open competitive exam. The selection is composed of two parts a written one, that includes the CV, a scientific project and a research summary, and a second oral one, where the candidate defends its CV and project in front a commission in Paris. The number of new positions depends from the number retirements in such a way to keep constant the number of active researchers. However in the last years due to cuts and extension of the age of retirement the number of new positions is rapidly decreasing. In 2010 there were 400 new positions that decrease to 300 in 2014. 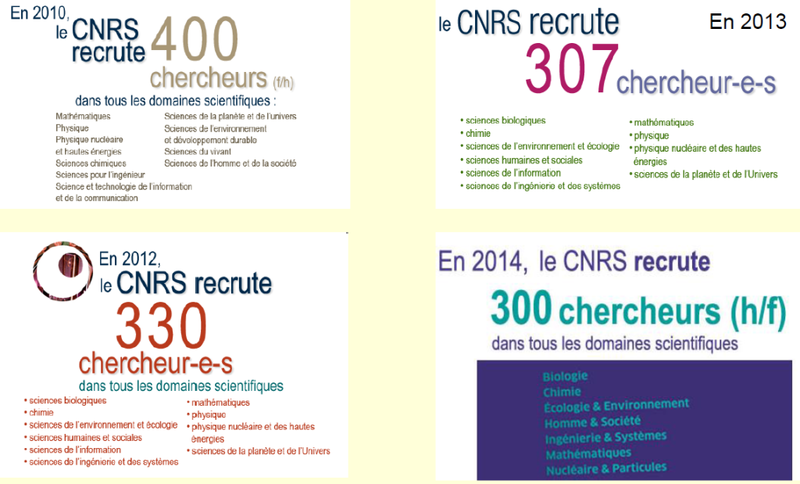 In 2015 CNRS didn’t publish the total number of new positions, so I spent some time to count them, and I got only 297 new research positions, and the forecasts for the next year are not rosy. This is really scary! The whole system is collapsing. A similar negative trend is also seen in EU and/or national funding schemes. We should find a way to change the present system. One reason could be that people do not realize why (fundamental) research is important. Since the public opinion does not care, politicians find easy to cut research budgets. “Nobody” cares in the end.